Killarney is among the stars of Ireland's glorious golfing south west, boasting beautiful scenery and an equally impressive array of golf courses. The highlight of a good Killarney tour is often the majestic Killarney Golf & Fishing Club, whose two exacting golf courses are as difficult as they are beautiful. In contrast to the countless seaside courses that Ireland is packed with, Killarney is a tranquil and serene retreat, offering golf in a setting of unimaginable beauty. 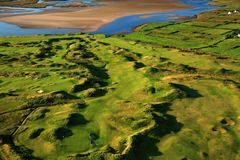 Ireland's south west is an enchanting destination, and is best experienced during a Killarney golf tour. To plan your perfect tour speak to our dedicated Killarney specialists. We found 8 offers matching your search. Need help? Call us on 0800 043 6644 to get the best deal! Sign me up to receive offers in Your Golf Travel's email newsletter (1-2 times per week). Learn more about how Your Golf Travel collects and uses personal data. One of our dedicated golf specialists will be in touch with you shortly. Hmm, something went wrong... would you mind trying again? Can't find the experience you're looking for? Make your own! Tell us what you'd like and our friendly golf specialists will help make it happen. When are you interested in going? I would like Your Golf Travel to contact me by telephone about my golf holiday plans. Your brochure will be with you shortly. Do you want to make an enquiry with us? Enquire now Need help? Call us on 0800 043 6644 to get the best deal! £200 group deposit - groups of 12 or more! Secure your flights from just £50 per person!